Dance of the Banished is an old tale. It's the familiar love story in which two young people are separated, here by family, distance and war. But, sadly, it's also the story of prejudice, fear, and injustice, and the subsequent torment that intensifies that separation. 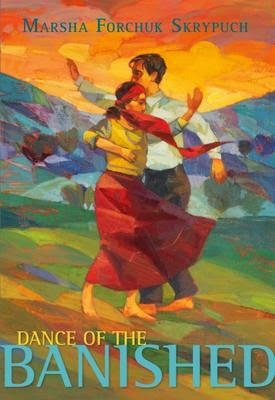 Dance of the Banished may be an old story in its foundations, but its context is wholly unique, expertly researched and penned by award-winning author Marsha Forchuk Skrypuch. Our story begins in 1913 Anatolia (now essentially the republic of Turkey), a nation of Christians, Muslims and Alevis, an ancient group with a unique Islamist belief system. When Ali, a young Alevi Kurd, unexpectedly immigrates to Canada with his married brother Yousef, he leaves behind his betrothed, Zeynep, another Alevi Kurd, giving her a notebook in which to write him until they are together again. Having planned to go together once they'd saved enough money, Zeynep knows Ali's mother has orchestrated this separation, and refuses to wait for him, though she gifts him with her blue evil eye necklace to keep him safe. Though both Ali and Zeynep record their experiences in their matching notebooks, providing the basis for this book, neither is communicating directly with the other. In fact, hearing nothing from Ali and no longer feeling a part of her community, Zeynep follows visiting Protestant missionaries to the city of Harput, hopeful of improving her lot in life, including getting an education. Though the lifestyles of the Christian North Americans and Armenians in their Western clothing and the Turkish Muslims differ significantly from her own, Zeynep appreciates this diversity, learning and helping the Reverend John Emmonds and his wife Lenore at the hospital and at their simple home. With much strife in Europe at the beginning of 1914, the Ottoman army is becoming more oppressive to the Alevis and the Armenians, raiding villages, taking whatever they choose, and finally, when Austria-Hungary and Germany declare war on Russia, threatening death to those who attempt to escape the draft or those who help them. Within a few months, the Alevis are starving, and the Armenians are being murdered en masse. Zeynep watches and listens, documenting all she witnesses in her notebook; in fact, she begins recording everything for the American Consul, Leslie Davis, who plays a significant role in saving the lives of many. Meanwhile, with the declaration of war in 1914, Ali and Yousef, like all foreigners, are let go from their jobs in Brantford Ontario. Rounded up as Turkish "enemy aliens", Ali and Yousef, along with many others, are shipped to the wilderness of Kapuskasing. Still in a minority, the Alevis are forced to cut majestic trees, contrary to Alevism, and endure the never-ending discrimination, even within the camp. On different sides of the world, Zeynep and Ali continue to honour their beliefs and heritage, though choosing to think beyond themselves, all the while wondering about the other, their safety and potential for reunion. Spotlighting little known historical injustices has become a trademark for Marsha Forchuk Skrypuch, her desire to enlighten and disclose indicative of her own integrity and search for equity. From the Armenian genocide (The Hunger, 2001; Nobody's Child, 2003; Daughter of War, 2008), to the Ukrainian Holodomyr (Enough, 2004), the treatment of Ukrainians during World War II (Stolen Child, 2010; Making Bombs for Hitler, 2012; Underground Soldier, 2014) and the Vietnamese War orphans (Last Airlift, 2012; One Step at a Time, 2013), Marsha Skrypuch ensures that transgressions, even atrocities, from our histories are not forgotten. By creating legitimate characters in her fiction who bring varied and personal perspectives to the situations experienced and who speak through their questions and confusions and convictions, Marsha Skrypuch can tell the whole story, not just the public one. In Dance of the Banished, we listen to Alevi Kurds and Armenians in both Canada and Anatolia, to those with family and those without, to the Turks shamed by the actions of their government and those complicit in the horrors, to Canadians who stood guard at internment camps and those who recognized the discrimination for what it was. Consequently, her readers submit to understanding the big picture, not necessarily the pretty, sanitized one. And we are grateful for that opportunity and bold honesty. Dance of the Banished reveals truths from Canada and Asia Minor that some may prefer to leave forgotten or hidden, but Marsha Skrypuch's words and heart tell us that we can trust her to tell it right and well, as she does so eloquently here and always. Today, across Canada, one hundred commemorative plaques are being unveiled to recognize the internment of "enemy aliens" such as Ali in camps across Canada. Check the map of all sites at the Ukrainian Canadian Civil Liberties Foundation here to attend one close to your location at 11 a.m. local time. Check back tomorrow for a guest post by author Marsha Forchuk Skrypuch who answers questions about Dance of the Banished for readers of CanLit for LittleCanadians. Helen, yours is the first review I have received and your feedback warms my heart. Thank you so much! And it was lovely to see you at the plaque unveiling and launch today! Thank you for the opportunity to read your book pre-release. It is a beautiful book, inside and out. And the commemoration was a truly moving experience. how important.so looking forward to reading it. is it is bookstores now? shall i order it? my room mate is Alevis...i will get one for her as well. still confused about "naming" internees from that area. i went to the Croatian commemoration event here in Vancouver. it was moving as well. i spoke and told a bit of Albert Bobyk's story and it began a conversation. it is so important that we have cross cultural dialogue. you have been doing that work for a long time. it was good to be with Croatian people. lovely. i did photograph for you and made video for ryan. i did the send the manuscript, the stories were not told, to Coteau. Look forward to reading this! Marsha's passion to keep these histories alive is so inspirational! Sandra, you can order Dance of the Banished at independent bookstores across Canada, and also via Chapters and Amazon. Thank you for your phenomenal work on internment stories as well. Dance of the Banished also has a significant story thread about a Cree woman.